Make it a jolly Christmas for the gift recipients on your list! 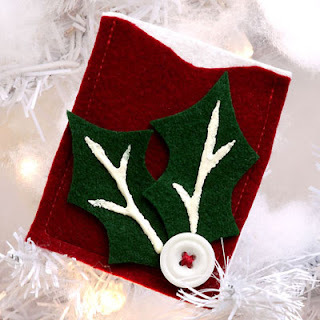 Deck your gift cards in boughs of holly with felt, Aleene’s Fabric Fusion® and Tulip® 3D Fashion Paint™. 1. Cut white and burgundy felt for card. Layer and sew white and burgundy on three sides to create pocket. 2. Sew a ¼” seam then trim to a scant 1/8”. 3. The front section can be cut slightly shorter on one side so back color shows. 4. Cut out dip in top layer if desired when finished. 5. Pin and cut out holly from hunter green felt then glue in place. White chalk can be used to draw patterns onto felt if needed. Brush off excess chalk after glue is thoroughly dry. 6. Thread floss through holes in button then tie ends in knot at back. Glue in place. 7. Test flow of 3D Fashion Paint on paper towel using an even pressure on bottle for a smooth line. Add Ivory veins on leaves. Keep tip of paint bottle wiped with paper towels for clean lines. Let dry.